If you’re looking to squeeze as much power out of your Nissan 350z, before long you’ll have to upgrade your exhaust headers. We’ve written about 350z exhaust systems, but those sort of modifications happen at the tail end of the car, where your exhaust gases are the coolest. Generally speaking, the OEM headers are reliable and of decent quality, but tuners and aftermarket specialists have managed to make alternative designs that will give your VQ35DE or VQ35HR engine more power. Exhaust headers are where your exhaust gases are the hottest. Getting those gases away from the engine as fast as possible will help your naturally aspirated engine to produce more power. It’s not the easiest mod you can do to your 350z, but being a bolt-on modification, it’s something that anyone can do with some patience and the right tools. It is one of the better ways to improve the performance and power of your car. This guide will go over the differences between exhaust headers and exhaust manifolds. Then we lay out the best 350z headers for people on a budget, and then for people wanting to bring their 350z to the track. On face value, headers and manifolds do the same thing. Both collect exhaust gases from each cylinder and guide them into a larger pipe which is sent through a catalytic converter, then a cat-back exhaust. It’s important to know that different regions use different names, which is why you’ll see people refer to them as headers, manifolds, or even “extractor manifolds”. Generally when people use the term “exhaust manifold upgrade” or “aftermarket manifold”, they’re actually talking about performance headers. These heavy pieces of cast-iron are cheap to produce and are generally reliable, which is why your Z33 left the factory with them. They are designed to get a good combination of fuel efficiency, performance and low-noise while meeting emissions standards. They aren’t designed for all-out power. OEM Nissan 350z exhaust manifolds push exhaust gases together as soon as possible. This is the major difference between a factory Nissan exhaust manifold and headers. There are some aftermarket cast-iron manifolds available, but most upgrades are classed as “headers” due to their design and construction. Something to note is, cast-iron exhaust manifolds usually require very little maintenance, unlike headers, which often require re-tightening. It’s not a difficult job, but it’s something to be aware of. In some regions, Nissan 350z exhaust manifolds are prone to cracking. 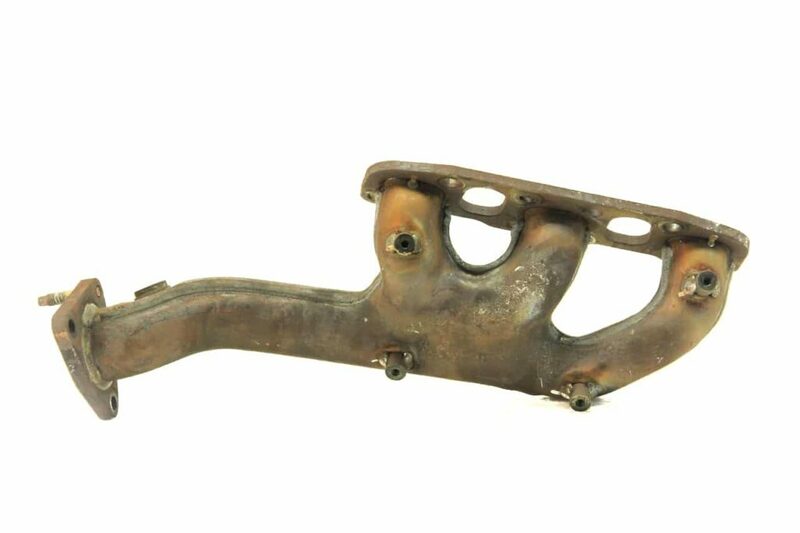 If you’re considering buying a Nissan 350z we suggest taking a close look at the manifold before making a purchase. Typically these are easy, bolt-on modifications. Headers make it easier for your engine to push exhaust gases out of the cylinders, by eliminating your manifold’s backpressure. Headers for the Nissan VQ engine use a 3-to-1 design that siphons each pipe into a single, larger pipe called the collector, getting the fumes out of your car quicker. Headers are all about the smooth and fast extraction of exhaust gases. Where exhaust manifolds push the exhaust gases together as soon as possible, headers allow the exhaust gases to travel in their own pipe for longer. In some cases, this is a lot longer – with some 350z long tube headers finally ending after your gearbox, replacing your stock catalytic converters. For a lot of Z owners, headers aren’t only a power upgrade – they’re an under-the-hood cosmetic accessory too. Well made headers look awesome and can make any engine bay look better. 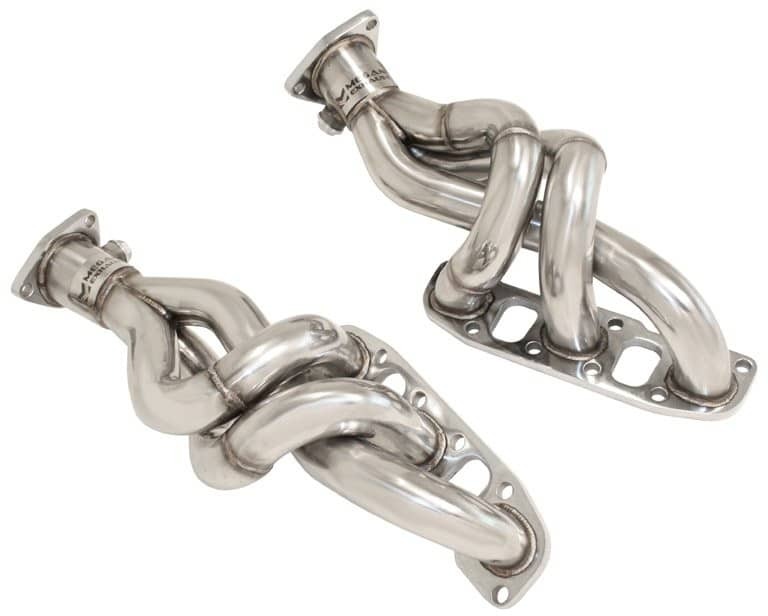 No matter how many performance enhancing parts you bolt on to your 350z, a restrictive OEM exhaust manifold creates a performance bottleneck, robbing your car of power and MPG. Since all engines obey the rule that fresh air can’t come in if spent exhaust can’t get out, the solution is to replace those clunky manifolds with a set of aftermarket headers, which will allow your car to breathe freely and easily. The added benefit of performance exhaust headers is an increase in horsepower, torque, and sound. The units listed here are mostly budget headers. For the most part, they’re only compatible with the VQ35DE V6 engine, from the 2003 to 2006 model 350z, and not the VQ35HR (2007-2009) engine. They’re decent enough headers to upgrade to but remember that some of these cheaper brands haven’t spent as much time dyno testing as the higher-end headers below. If you’re going to spend more on any component for your car, we’d suggest headers is that part, as cheaper units are prone to cracking. However it’s not always possible to do that, so we’ve found the most reliable units for you. 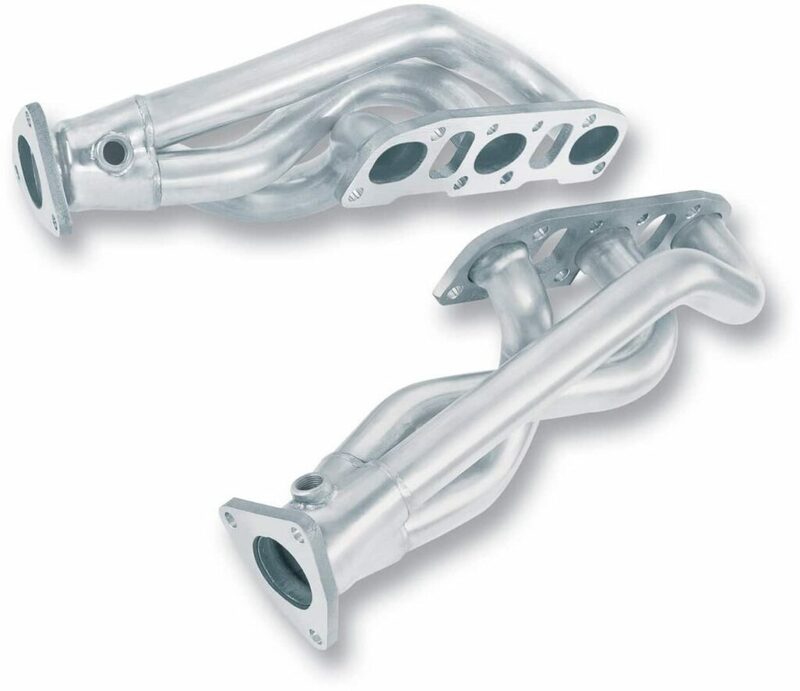 Though Manzo offers inexpensive Nissan 350z headers, they’re still quality products. Their construction is strong and durable. The welds are clean and well put together. These are affordable headers, but they aren’t cheaply made products. These headers will add some great sound/rumble to your car. You should get a small HP increase with Manzo’s headers after a tune. 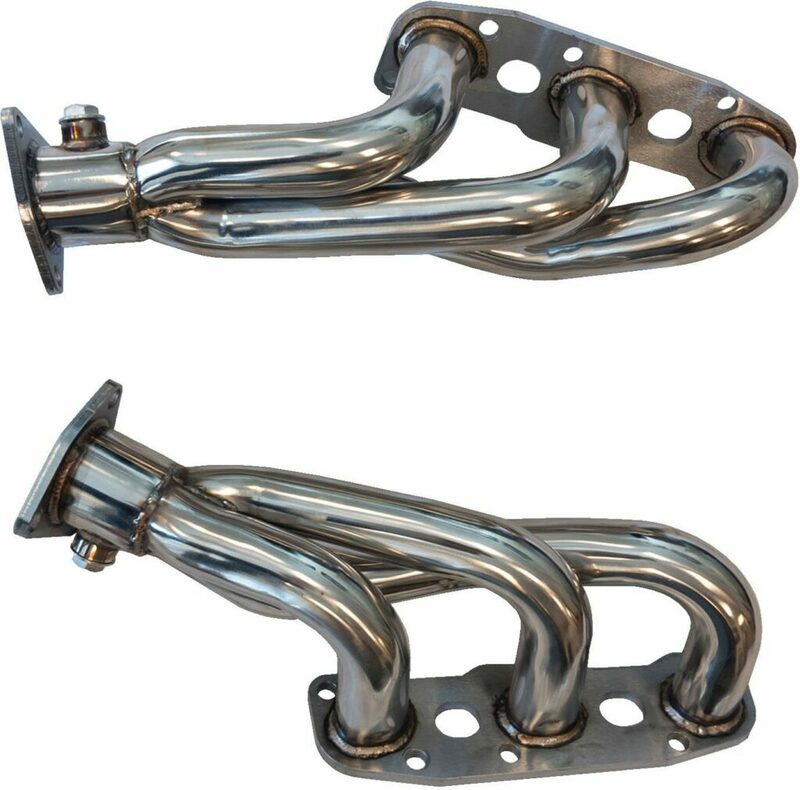 Linesracing’s stainless steel 350z headers are TIG welded and mandrel-bent to help with increased performance. These slick, polished headers look much nicer than the price would suggest. These headers are claimed to increase torque and add around 15 HP to your Z’s power output. You’ll also notice a louder, improved sound coming from your exhaust. What we like about these headers is that the package comes with all the necessary bolts and gaskets. It’s worth noting that instructions aren’t included. Headers are simple enough to install but that may be a deal breaker for you. They also come with a three-year warranty, meaning they believe in the quality of their welds. Megan Racing’s 350z headers have a wider outlet diameter than the other headers we’ve listed in this category, helping them to breathe better. This does make installation a tighter fit and means they have limited clearance between them and the steering column. Some people complain that creates rattling and contact during hard cornering, though it will depend on your specific car and how straight the rest of your exhaust system is. The thick flanges and strong welding of Megan Racing’s stainless steel headers do help prevent cracking, so they’ll last a long time. This larger diameter tubing helps to maximize exhaust gas flow, making your engine more efficient, and adding power and torque. These may not be the best 350z headers for performance, but you can’t beat the price, especially from a household name like Megan Racing. These headers are prized for their horsepower and torque gains, as well as for helping you car sound like a racecar. For the most part, they’re compatible with all 350z models and engines. When an independent reviewer dyno tested a first generation 350z with Borla’s stainless steel headers, they were found to add 10 HP and 3 ft/lb of torque to the car. Besides performance increases, these headers will also add a great sound to your exhaust. The Borla stainless steel headers are a bit smaller than most, but Borla is a household name with a solid reputation, so you should expect they’ll fit and work well. Borla also offers a one million-mile warranty with their products, which is 20,000 miles per year for 50 years! Perhaps best of all, the headers are designed and fine-tuned to your specific vehicle to optimize performance. DC Sports’ 3-into-1 ceramic headers are great for street or track applications. They’re a bit easier to fit, unlike some of the other headers in this list. They’ve also been dyno tested to ensure an increase in horsepower across the RPM range, though you’ll get more power at low- and mid-range acceleration. These headers will give your car a nice, throaty growl and are a good addition to a high-flow cat and quality cat-back exhaust. Unlike many headers, this set from DC Sports are CARB approved, meaning they’re street legal in all 50 states. That’s a huge plus for avoiding getting tickets! When dyno tested on a 2003 Nissan 350z 3.5-liter V6 engine, aFe’s twisted steel headers produced a max gain of 9 HP and an awesome 11 ft/lb of torque. There’s the potential for more gains, up to 16 HP and 15 lb/ft of torque when combined with aFe’s Y-Pipe. This makes a great combination for the track. Of course, you’ll need to reset your ECU at a minimum, if not get a full tune to see the best results. Like many of the others listed here, aFe’s twisted steel headers are not CARB exempt, so you can’t use them on a street driven car in California. 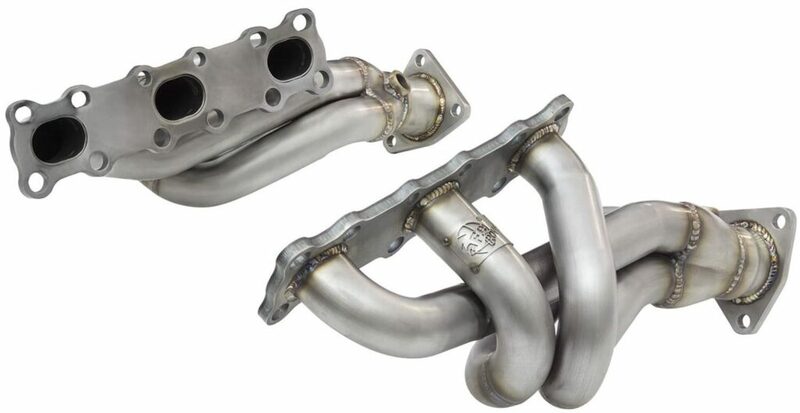 ISR Performance offers track-ready, 350z long tube headers at a low price point. They have a “HGC” or High Ground Clearance feature that puts the collector in a position to maximize ground clearance, meaning less scraping over speed humps. These headers are great for retaining low- and mid-range torque, while also providing ample top end horsepower gains. These headers are some of the best 350z headers in terms of fitment, which is always great to avoid unnecessary headaches. 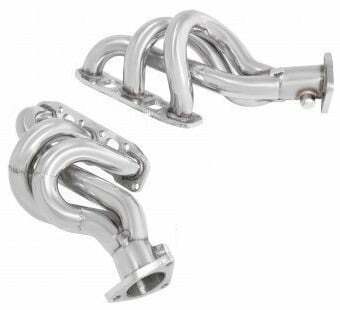 These 350z Tomei headers are some of the most highly praised headers for the 350z. They are made with a super lightweight design, which will help your car’s handling and make turning easier. They offer a dry racing sound, as opposed to a throaty growl. We’re not saying it will make your Z sound like a Ferrari, but you’ll definitely pick up some of that “supercar buzz”. Developed by Japanese tuning house Tomei, these 350z headers will give you instant throttle response and a real racing experience, making them perfect for the track. The V2 exhaust manifolds will improve mid-range torque more than low- or high-range. The system is not CARB exempt, meaning they’re not legal for street use in California. PPE Engineering’s 350z long tube headers are coated in “JetHot” ceramic coating to decrease thermal performance loss. 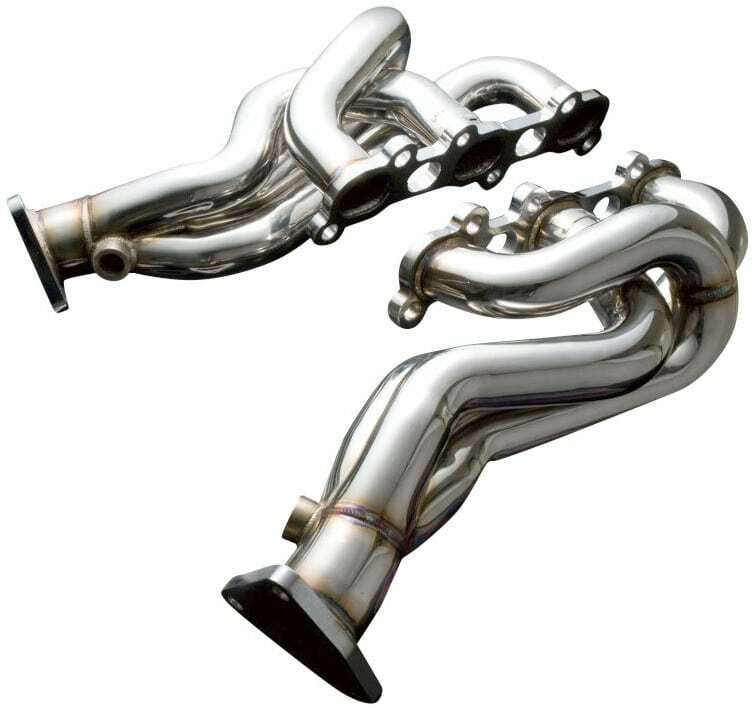 They’re the most expensive, but also arguably the most advanced headers available for the 350z. As they are “long tube”, they will replace your OEM catalytic converters. It’s basically the equivalent of replacing your OEM exhaust manifold and running test pipes at the same time. PPE claims a 10-HP gain when tested with performance camshafts, or a 3.5-HP gain on a stock 350z. No doubt their figures are conservative, while many other brands are optimistic. They are great for boosting mid-range and top-end power, especially over shorter headers. The sound produced by these headers is exceptional. Sound isn’t the first reason to install aftermarket headers, but damn they sound great. 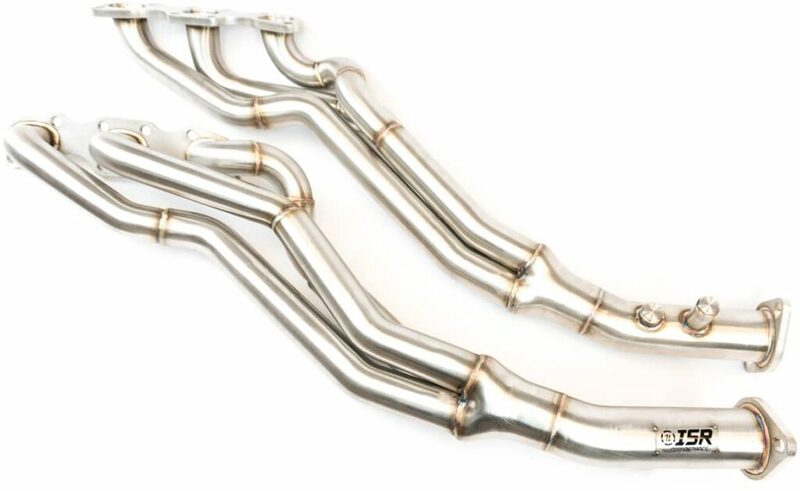 If you’re serious about giving your car the best, you can’t go wrong with these headers. They also come with a one-year warranty. 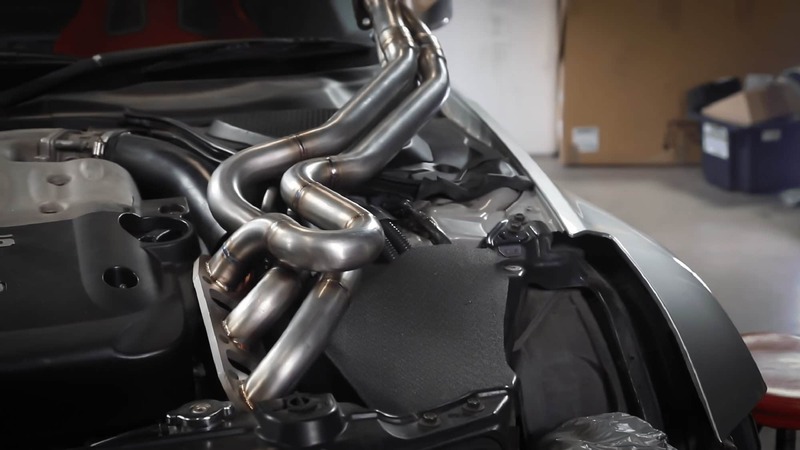 Crawford’s Equal Length Headers for the 350z took a year to develop, through trial and error, and they claim the most power gains of any headers on the market. Combined with their plenum spacer and high-flow cats, they say you can expect 20 HP at peak and 40 HP at redline. We’re not saying this isn’t true, but it’s worth remembering that you need to upgrade multiple components, then get a tune before seeing the performance increase. Some people have had issues with the complex “spaghetti” design of the tubing, saying they’re a snug fit and difficult to install. The tubes are also longer than most on the market. Some also had welding issues. But this is the price you pay for hand made, non-mass produced products. If you’re looking for pure performance gains, and you want to be able to pick up the phone and speak to the guy who welded them, Crawford’s equal length headers may be the way to go. So there you have it. On average you can expect to get in the range of 10-15HP extra out of your Nissan 350z by upgrading to headers. To get the most out of upgrading your exhaust headers though, you’ll want to replace your full exhaust system, upgrade to a cold air intake, install a set of aftermarket cams and get a proper tune. Generally when it comes to choosing headers, you’re making a choice between price, performance, sound and workmanship (which can mean cracking in a few years time). Not only are Linesracing’s stainless steel headers insanely cheap, but they also add quite a bit of performance gains and will improve the sound of your car—the best of both worlds. 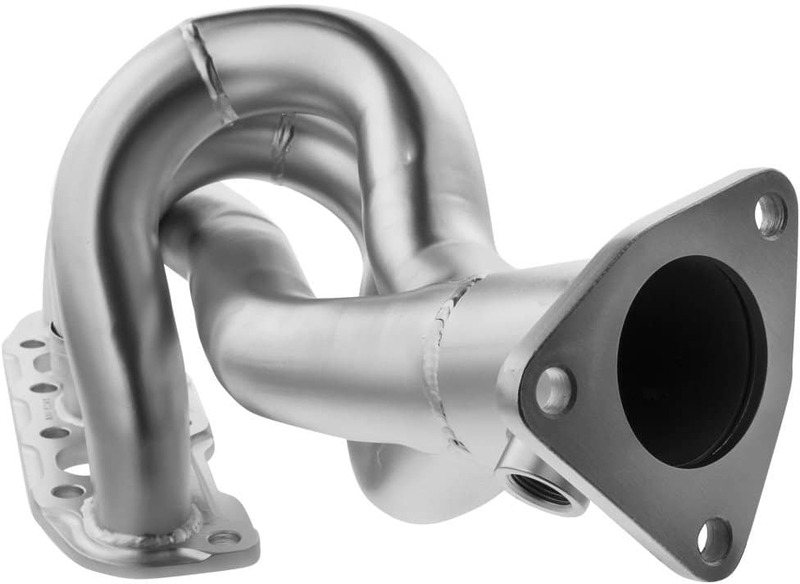 While most of the headers listed claim horsepower and torque gains, the aFe Power twisted steel headers are the only ones that consistently get great results on the dyno. 9 HP and 11 lb/ft torque gains from a simple bolt on and ECU reset is great, and when paired with a Y-Pipe, you can squeeze out even more performance (up to 16 HP and 15 lb/ft of torque). The 350z Tomei headers are not only one of the best options for making your car sound like a racecar, but they’re also great for making your car act like a racecar. Their lightweight design drops a good bit of weight off of your car. And the dry racing sound is much more appealing than the throaty growl that most 350z headers offer. When it comes to workmanship, it’s hard to look past the PPE Long Tube headers. They are proven from a performance point of view and do sound great, but they’re even better to look at under the hood. These may be the best all-rounder from this list – though they aren’t cheap! What headers are you running in your Nissan 350z? Let us know in the comments below!